In the old world, if you had your own parameters set up within AdWords in addition to HubSpot’s, we wouldn’t be able to handle this. If tracking was applied at the account level, HubSpot would overwrite any custom values with our values. If tracking was applied at the campaign level or lower, the ads would not be tracked in HubSpot. This was a major problem for users who wanted to track their ads in places other than HubSpot. In addition, we used to use separate tracking parameters for each network. This meant that the values accepted by the ads tool for tracking parameters of AdWords ads were different than the values accepted for Facebook ads. This led to a situation where each network had its own “counting” system, making it difficult to fully track your ads within HubSpot. In this new world of ads tracking, we will merge our parameters with any existing AdWords parameters in your account or campaign-level tracking templates. For Facebook, we will (continue to) merge with any existing parameters at the ad level. In addition, we will now use one set of tracking parameters across all supported ad networks. These changes simplify and unify the tracking used for ads within HubSpot. In the near future, we will remove our old tracking parameters and apply our new set of tracking parameters to all ads except Facebook ads that have more than 20 engagements. Facebook adds tracking parameters to each individual ad, so editing the tracking parameters would reset Facebook’s ad optimization algorithm. For AdWords, we are moving to campaign level tracking. 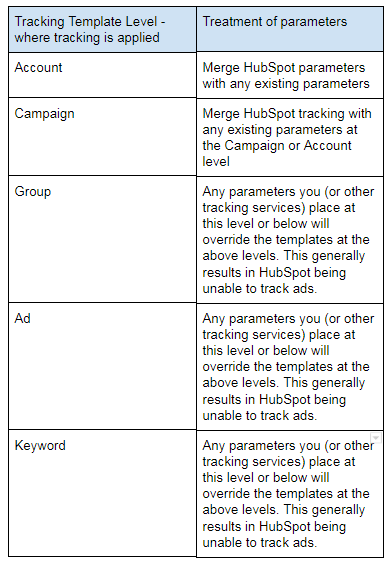 Any tracking parameters you have set up within your AdWords tracking template at the campaign level or above will be merged with HubSpot’s tracking. Its worth noting that if you have an ad template at the group, ad, or keyword level, we will still be unable to appropriately track that ad because the templates at these lower levels will override the tracking we place at the campaign level. Note: AdWords applies tracking parameters to the final destination URL for each ad. AdWords uses parameters from the “most specific” level that is populated (e.g., the ad level would be more specific than the campaign level). HubSpot needs these parameters to be populated in order to track the performance of ads. If you have parameters in the AdWords tracking template below the campaign level, HubSpot tracking will likely not function properly. The following chart details how HubSpot will treat tracking parameters going forward. For a full rundown of how tracking works in the Ads add-on, feel free to refer to this knowledge doc. We will be progressively rolling this out over the next week. This update will primarily impact Ads Add-on users who make use of AdWords.